Your debit card does more than just allow you to make purchases with merchants and online retailers. You can also get cash from automatic teller machines (ATMs) with a debit card. For some people, cash withdrawals are the only reason for using a debit card; a credit card can be a better tool for your every day and online purchases. An ATM allows you to withdraw cash, make deposits, view your balance, and more. Except for deposits and withdrawals, you can also accomplish most of those tasks online. Safety first: Before you use an ATM, make sure it’s safe to do so. Only use ATMs in clean, well-lit places. Sometimes thieves hang around waiting for people who have obviously just withdrawn cash. Look over the ATM to see if anything looks suspicious. Thieves can install hidden skimming devices on ATMs. Those devices can steal your card number, and there might even be hidden cameras nearby that can see you type in your PIN. If anything looks funny, move on to a different ATM. 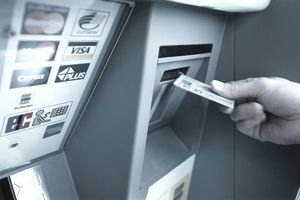 Insert your card: The first step is typically to insert your card into the machine. You might have to stick it in all the way (the machine will take the card and hold on to it), or you might just push the card until it stops and pull it back out. You can do this quickly; the machine can read your card instantly. Follow on-screen instructions if you’re not sure what to do. Enter your PIN: ​To access your accounts, you’ll need to prove your identity by entering a personal identification number (PIN). Be sure to cover the keypad as you do this because you don’t want anybody to see your PIN. You can either cover your typing hand with your free hand or block the keypad with your body. Putting your hand in the way is best, in case a hidden camera is installed on the ATM. Request a transaction: ​Once your identity is confirmed, proceed with your transaction. You’ll get a list of choices, such as a balance inquiry, cash withdrawal, or deposit. You can often complete multiple transactions in one session—for example, checking your balance and then withdrawing funds. Follow the on-screen instructions to choose the type of account and amount. Watch for fees: ​Before your transaction is completed, the ATM should inform you of any fees related to your desired action. Decide if you can or want to pay those fees before you proceed, and keep in mind that the ATM only shows one set of fees. Your bank might charge additional fees for using a “foreign” (not bank-owned or affiliated) ATM. To dodge these fees, use an ATM that is part of your bank’s network. Credit union members can often use ATMs and branches at other credit unions for free. Finish the transaction: ​Be sure that you have your card in your possession before you walk or drive away from the ATM. Store any cash quickly. Don’t display funds while you walk away from the machine; this tempts thieves. Finally, check to see that your ATM session has ended and the next person in line can’t continue using your account. Press the Cancel button several times if you have any doubts. Once you get the hang of using ATMs, you can use them for more than just cash withdrawals. You can deposit checks and transfer money between accounts, and some ATMs may even allow you to talk with a customer service representative via video conference. Several different types of cards are available, so you may be confused about which cards work at ATMs. Those cards go by a variety of names, and almost all of them allow you to withdraw cash. However, the cost of using those cards varies, and the additional features are different. ATM Cards pull funds from your account in a bank or credit union. The account might be a savings account or a checking account. Debit Cards and ​Check Cards pull funds from a checking account or a money market account (but generally not savings accounts). They can be used to withdraw cash and make purchases. Prepaid Debit Cards can be loaded with funds when you add money to the card, and you can withdraw cash and use the card for purchases. Prepaid cards are an option for people who don't have a bank account due to distrust of banks or an inability to open an account. Credit Cards allow you to borrow money, but you often have to pay high-interest rates on your loan balance. Credit cards can be used for cash advances, but you’ll pay even higher fees and interest rates to do so. The earliest cards were ATM cards, which now have limited functionality compared to other card types. At some point, the banks must have figured out that they could get customers to do a lot more than just use debit cards at ATMs. People were carrying them around everywhere, so why not turn them into payment cards? As a result, banks and payment processors joined forces, and almost nobody issues an ATM-only card anymore. They’re almost all debit cards that you can use at retailers, online, and just about anywhere you’d use a credit card. Know your balance: Before you make a withdrawal, make sure you have funds available in your account. Even if you recently deposited funds, those funds might not yet be available for spending. Know your bank’s policies, and check your balance online or at the ATM so that you don’t face or create additional overdraft fees. Purchases and spending: A debit card is great for making cash withdrawals. You can also make everyday purchases and shop online, but it might be best to use a credit card for those tasks. Your debit card is directly linked to your bank account, so any fraud or errors will drain your checking account. A credit card creates a buffer, giving you more time to fix any problems. Choose ATMs wisely: The best place to use an ATM is inside of a locked or secured building because the machines are less likely to be tampered with. Bank branch lobbies are a good example of these locations. If using ATMs on the street, pay especially close attention to any potential skimming devices and individuals watching you.